Approximately 5 miles. $1 payable to Hike leader to help pay for the cost of website. PLEASE FOLLOW THE DIRECTIONS IN THE WRITEUP BELOW TO GET TO THE TRAILHEAD. This Loop isabout 5 miles long. This hike is rated moderate for its elevation gain and distance. The group hikes between 2.5 and 3.5 mph. If you cannot hike at a minimum of 2.5 mph, please do not sign up for this hike. I recommend this hike for people who are already in shape and want a mid-week conditioning hike. Follow the directions to the trailhead as indicated below. Drink plenty of water prior to and during the hike. Note that we are starting at the Las Virgenes Trailhead on Las Virgenes Road. If you want to bring your dog, it’s fine as long as the pooch is leashed. 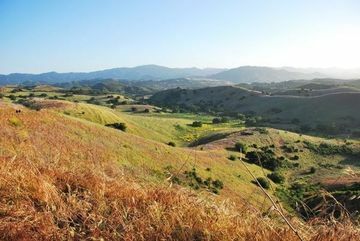 We will start at the northern end of Las Virgenes Rd and hike to the Cheseboro Ridge Trail. We’ll then proceed up to the Cheseboro Ridge Trail and complete a loop. Directions: To get to trailhead take 101 and exit Las Virgenes Rd. Turn north (away from beach) to end of road. If you are coming up from PCH, drive up Malibu Canyon to the end (Malibu Cyn changes its name to Las Virgenes Rd). The trailhead is marked clearly. Park on the street. If you can’t park near the trailhead, just look for space down the street. We’ll wait until you walk to the trailhead. DISCLAIMER / RELEASE OF LIABILITY IMPORTANT, PLEASE READ BELOW IN ITS ENTIRETY: Outdoor sports and other events we plan are inherently dangerous and accidents may happen. By participating in any posted event, you’re taking responsibility for your own safety and well-being. The Thousand Oaks Hikers Group and it’s organizers are not trained leaders and we do not confirm the qualifications of any of its members to lead or participate in trips. All participants take full responsibility for their own actions. If you choose to sign up for any The TOaks Hikers Group events, you are releasing the TOaks Hikers Group and it’s organizers from all liability in case of possible injuries. Your personal safety depends on your own judgement and experience. Responsibility: I am not responsible for you. You are responsible for you. You should be self-sufficient and be able to find your way to safety in the event you find yourself on your own. I will not lead you back to the trailhead if you decide to turn back. Disclaimer: The organizer, assistant organizers, and event hosts take no responsibility and will not be held responsible for any injuries or accidents that may occur during this hiking event. Hiking can be inherently dangerous and accidents will happen. By participating in this hike posted on this meetup web page you are taking responsibility for your own safety and well-being.